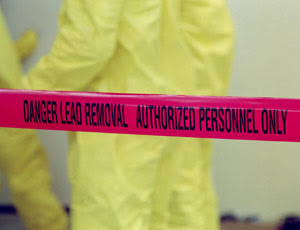 OSHA’s standard for protecting workers from lead (29 CFR 1926.62) celebrated its 20th anniversary this year. If you’re not “in the industry”, not a lead-safe worker, and not properly trained, you are risking your health and the health of those within arms reach of your home renovation. Sure, you could throw on a respirator and zip-up in a protective suit, in an attempt to decontaminate your home, but do you really know what you’re doing? It may seem easier than it actually is and many home and business owners do attempt to do the work themselves. But, if it isn’t done safely and correctly, you’re not only putting your health at risk, but your children’s, your pet’s, and the health of anyone else who might be close by. If you are dealing with a pre-1978 home or building, you will most likely encounter lead paint. Lead dust is the leading cause of lead poisoning in children-leading to hyperactivity, lower IQ, Attention Deficit Disorder, other adverse health issues, coma and even death.Most children come into contact with lead dust because of a dusty, dirty home or daycare, renovation work at their home, or because a parent brings it home on their clothes from work. This is an enormous concern because it only takes a very small amount of lead dust to poison a child and forever change their life. Know the facts before you take the risk. 1. Understand airborne pollutants and where they come from. Airborne Pollutants could include: dust, mold spores, pollen, dust Mites * pet dander, bacteria & viruses, carbon monoxide, odors, volatile organic compounds, formaldehyde, pesticides, household cleaners, exhaust fumes, smoke, lead, asbestos and more. 2. Eliminate and/or neutralize the pollution source. – Use non-toxic cleaning products-free of VOCs. – Incorporate many indoor plants to filter the air. – Regularly air out your home. – Minimize pollution-no lawn chemicals, pesticides, etc. – Stay away from major contaminants. – Install an air purification system. CONTACT TITAN ENVIRONMENTAL FOR A CONSULTATION. Visit our Facebook page to see how you can SAVE 10% on our services! !